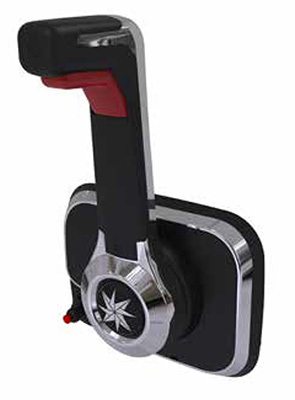 The ergonomics and features of our Xtreme controls are advanced beyond those of any other control on the market. A shapely, balanced handle design provides an incredibly smooth yet positive feel. Neutral interlock, throttle warm-up, and start-in-gear protection features are standard on all Xtreme Side mount models, with power trim/tilt, emergency cut off switches offered as an option. In addition the cosmetics of these controls can be configured to suit many tastes on center console or Port side mounted boats. Xtreme center console controls are suitable for use with both 3300/33C universal or OEM type control cables without adaptation at the control.